This is just nasty. Ugh. 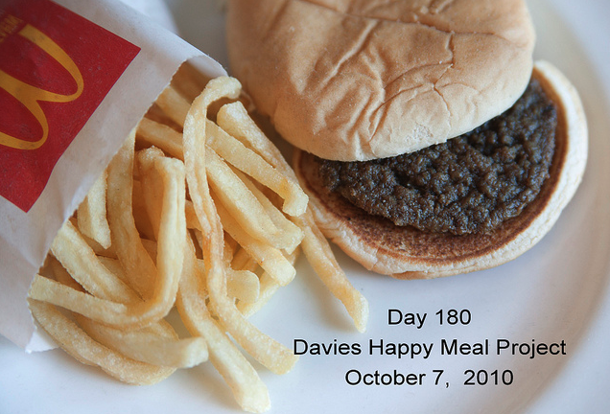 That’s the disturbing point brought home by the latest project of New York City-based artist and photographer Sally Davies, who bought a McDonald’s Happy Meal back in April and left it out in her kitchen to see how well it would hold up over time. The results? “The only change that I can see is that it has become hard as a rock,” Davies told the U.K. Daily Mail. I knew McDs made me sick but boy does this ever make you wonder. Funny thing is the article has a quote from a Doctor at a Center for Food Safety and he says that no hamburger would look like this after a year unless it was tampered with or frozen. I can agree with that but at the same time I have a bad feeling this wasn’t frozen or tampered with in that time frame.